Printed Euro tote paper bags have become important art of branding and marketing,and quality custom printing euro tote paper bags can present business and products the best.And Euro tote paper bags offer the best printing effect,it means euro tote paper bags are the perfect choice to print any fine art work.With custom printing,Euro Tote Paper Bags will become wonderful advertisement without paying too much cost. If you want to print business and product photographic image to display your business and products,Full color (CMYK) printing is the best choice.With full color printing,Euro tote paper bags are not only as luxury bags to convey goods, but also as promotional tool to advertise business information everywhere with movement of euro tote bags for long time. printing area of cmyk full color is no limit,from 10% to 100% ink coverage. 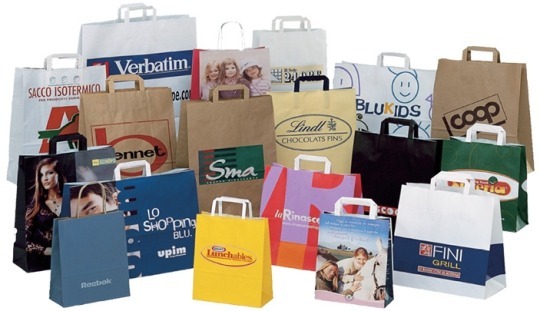 Shopping Bags Mart specialize in manufacturing quality euro tote paper bags,custom printed euro tote paper bags,euro tote laminated paper bags coming in any size and color,guaranteed cheap price,short run is available. Shopping Bags Mart wholesale kraft paper bags. Kraft paper bags are great as carrier bags and promotional bags,because kraft paper bags are not only 100% recyclable,but also very cheap.Because some kraft paper bags are made of 80g kraft paper glued with flat paper handle or twisted paper handle.It is very cost effective way to build bags.